I can’t tell you when I got the sea glass bug. Well no, maybe I can. The year was 2002, when I read the Anita Shreve’s novel, Sea Glass. The historical romance focused on Honora Beecher, a young bride, and her husband starting out life amidst 1920s moral turmoil, of bad judgement and how their fragmented life is mirrored by bits of sea glass collected near their home in New Hampshire. I was smitten by the idea of Honora collecting these beach jewels. Was that a bygone hobby In this age of plastic? I found out later while studying in Maine. I met Mary, a fellow student from Delaware, a princess if not a queen. She took me on a hunt along the edge of Bailey’s Island. Sure enough, there were bits of brown and clear and green glass among the well-tumbled pebbles and broken sea shells. “The trick is to look for something man-made, Mary said. Man-made—an unusual color, something angular. After finding a few shards of drink bottles, I was hooked. It’s the color, history, nature’s work on our junk. I don’t know where I’ve been all these years. 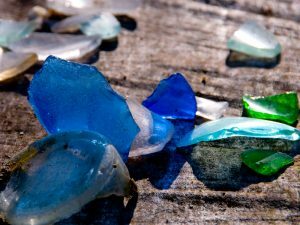 I could have been looking for sea glass instead of sea shells at my decades of beach trips, but better late than never. We dropped everything and hustled on up to Woodland Beach on Delaware Bay. It helps to have Philadelphia and Trenton and Wilmington nearby. They mean busy sea lanes where plenty of things getting dropped or tossed into the water. There are heavy things such as cement pilings and bricks that have been tumbled into ovals, remnants of wooden barrels and even a fiberglass potty. Hunting for bits of glass in such a place takes patience and a keen eye—and stretching to keep your neck and lower back from cramping up. But after an hour of scouring that beach—with a few other sea glass hunters—I came upon a Nehi bottle, well-barnacled. The pressed herringbone pattern tells me it’s probably pre-World War II. I found part of a square drink bottle I can’t identify, several pieces of green, brown, aqua and white milk glass—all lost and found somehow from ship to shore. Yes, this is a trash dump of sorts, but the fact that the stuff has been well-washed and tumbled to a new shape puts these finds in a different category from trash. Every time I pick one out of the sand, I wonder how long it’s been in the ocean and how it got there. In my mind I make up stories: boaters on a beautiful Sunday afternoon, sailors heading off to war, a long-ago shipwreck. Mary had great luck that Wednesday at the old Indian River Lifesaving Station. We walked the beach with a good bit of luck, but the real discovery was later, in the restroom. On a shelf in one of the stalls, someone had left shells and two bits of rare rose-colored milk glass. My imagination went to work again. Pink-shaded milk glass was popular in the ‘50s but it’s been made since the 1600s. Mary realized the rarity she’d found and tucked them away for safekeeping. She wants to have jewelry made from them. I’ve begun following some stellar sea glass hunters on Instagram. This finders’ world involves all sorts of “mermaid loot” on the beach—sea plastic (parts of toys, Army men, dinnerware, etc.) sea pottery (shards of dinnerware and decorative pieces), and sea metal, for example. One collector recently posted a tiny lead pine tree that had been part of a toy ice skater set made in the 1890s. Where was this piece all this time? Only the sea knows. I’m just content to keep my glass in a jar as a reminder of a pleasant day when these tumbled bits of history found me walking along the sand in search of treasure.